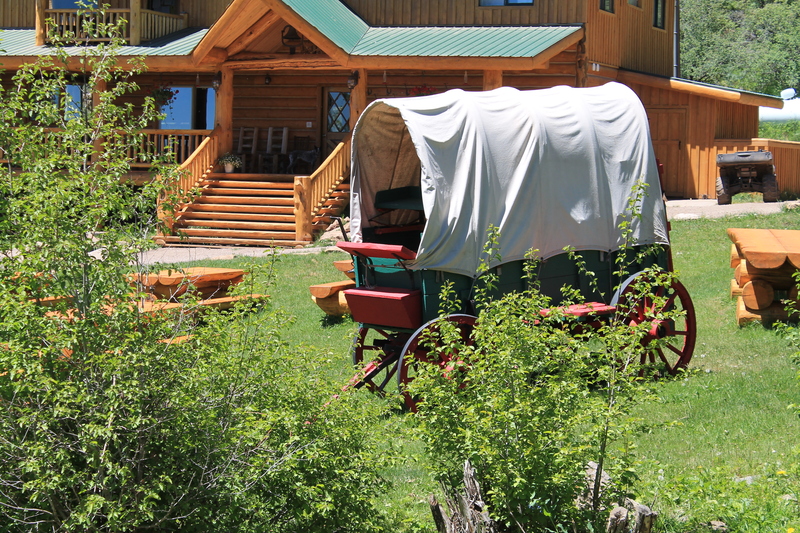 The ranch was all at once enchanting, charming and vastly stunning. 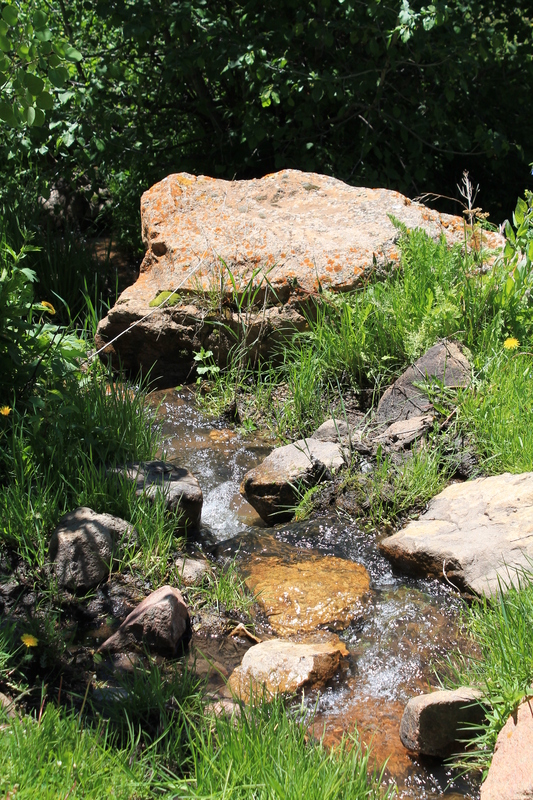 A wildflower lined bubbling brook (it really bubbled, I’m not just using a cliché here) meandered through the property leading to an almost shocking view of the mountains and valley below. 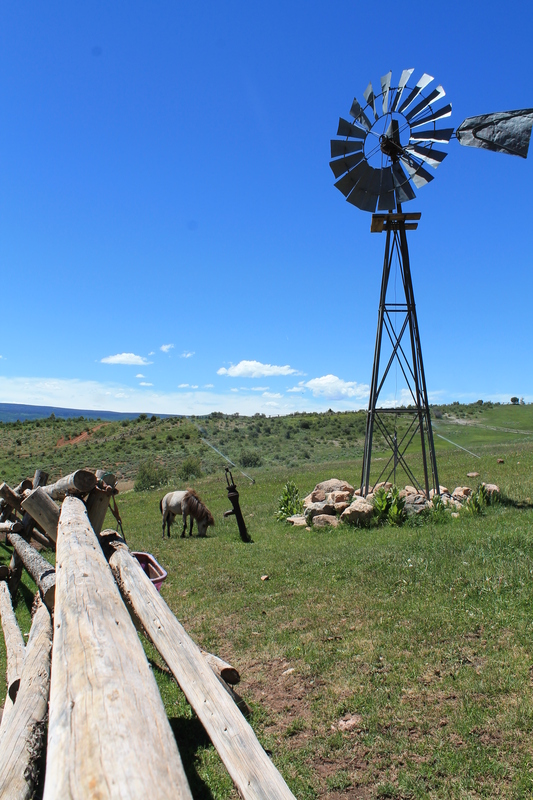 Our trail rides consisted of rugged, rocky, steep and curvy sections followed suddenly by a natural mountain meadow. Wildflowers were everywhere. I seriously wouldn’t have been surprised to see fairies flitting from bloom to bloom trailing pixie dust. It was that kind of magical. 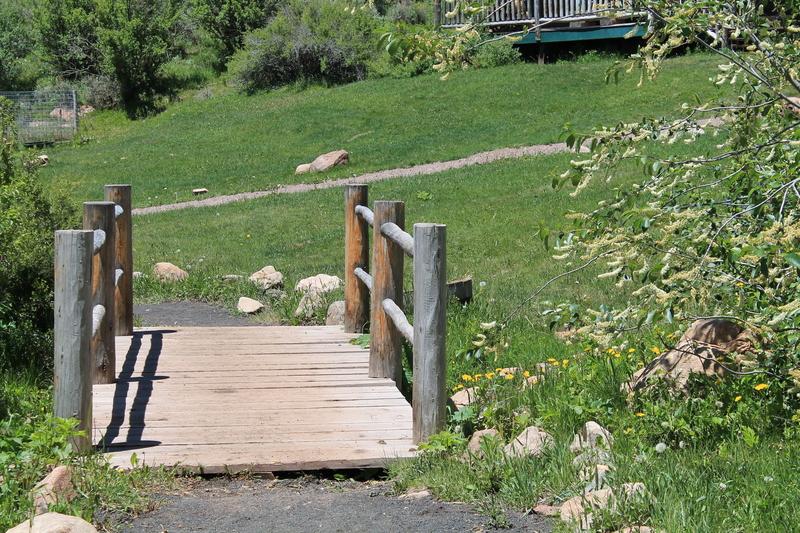 This little bridge actually got ice on it one night….but it was my favorite spot on the way to our room. 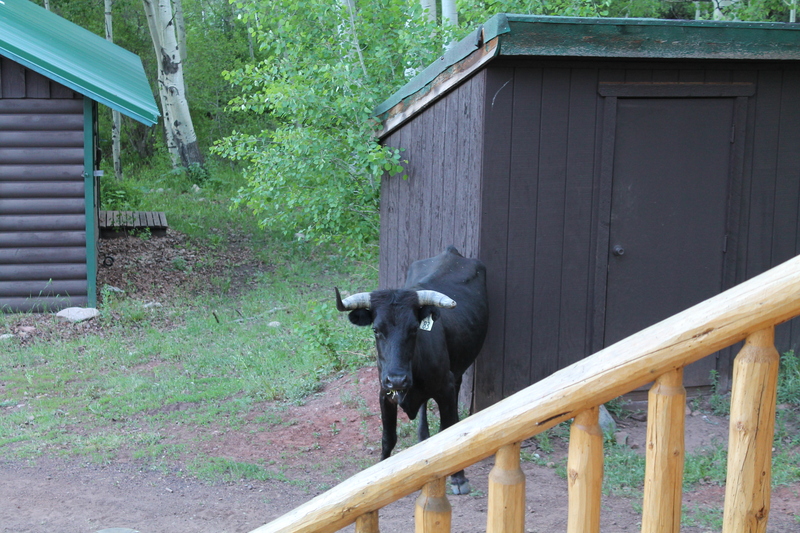 The first morning we woke up to the sound of this little guy mooing outside our door. Apparently he got lost. 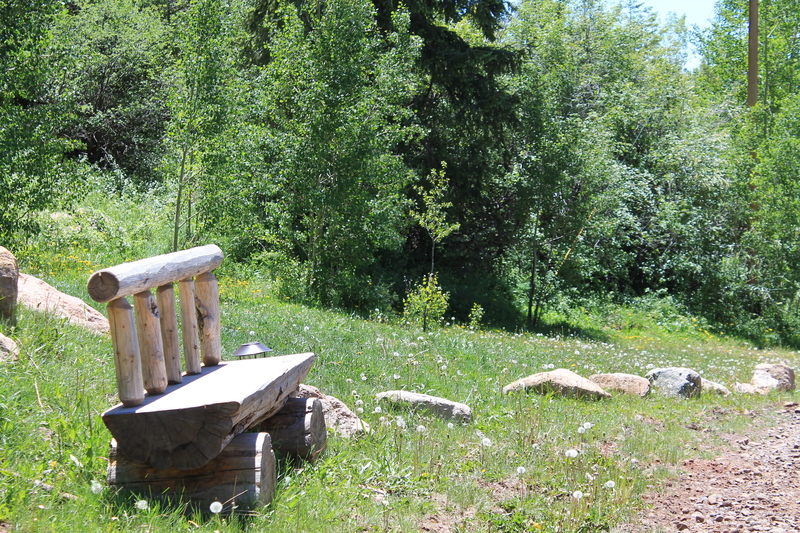 There were cute places to sit and enjoy the scenery all over the ranch. 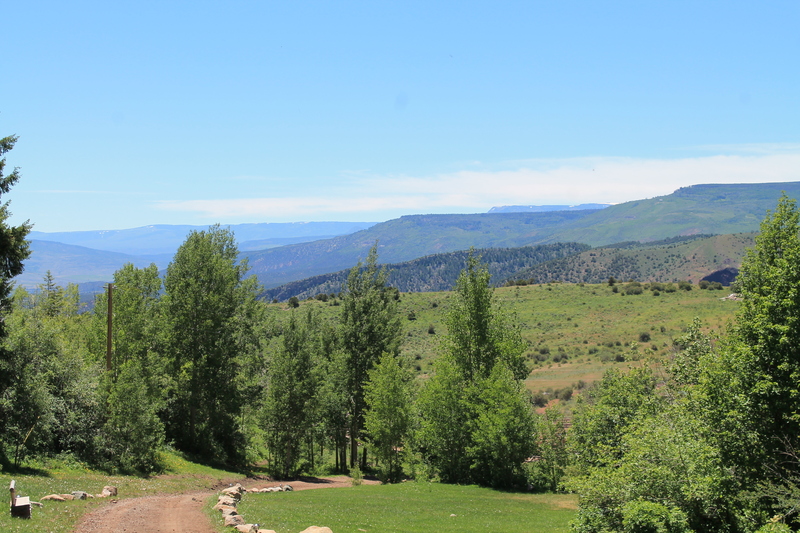 Picnic area and mess hall…aka food. Coral and barn. The horses hung out in the coral during the day and were turned out in a 40 acre pasture at night. 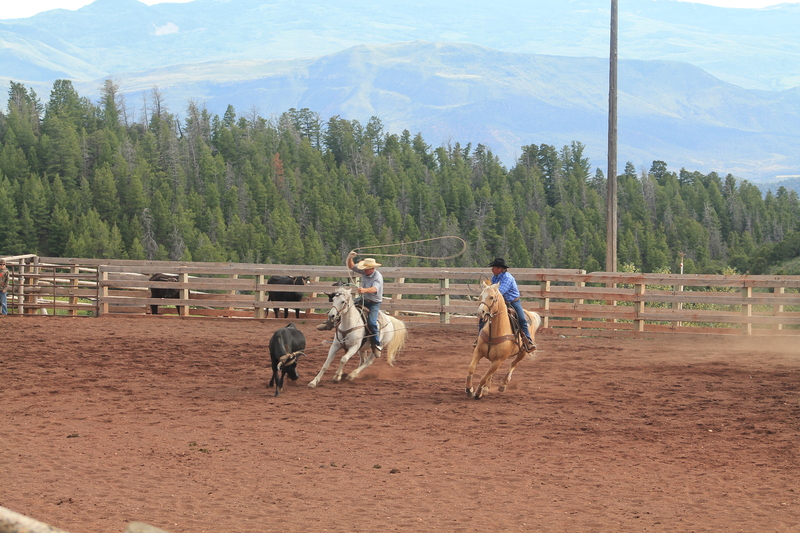 Steer head for practicing roping. A skill which surprisingly would have come in handy. Hugo the donkey saying hi and getting scratches. He also followed us on our first trail ride of the week. 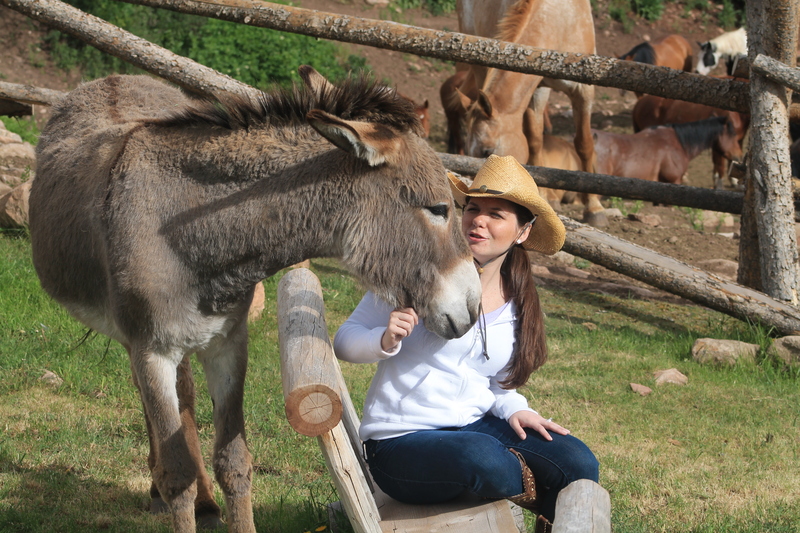 Donkeys are now a must for when we get a farm. 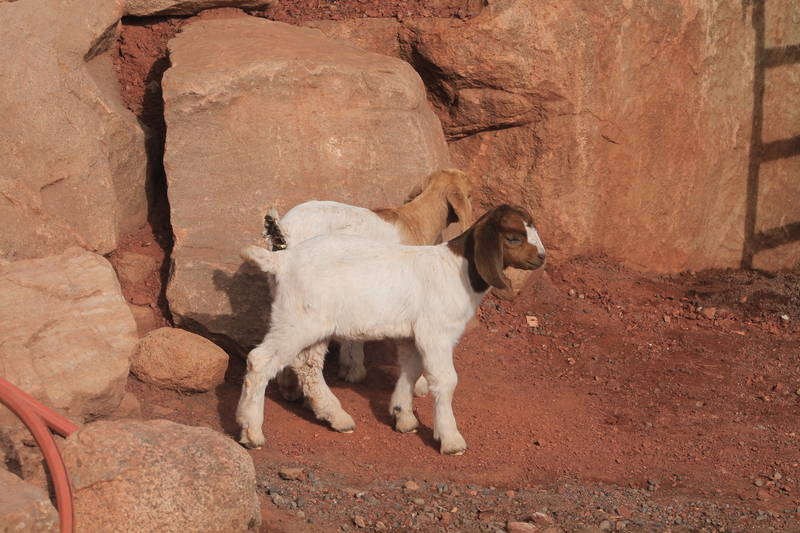 Baby goats! We got to bottle feed them and it was all fun and games until I got pooped on. 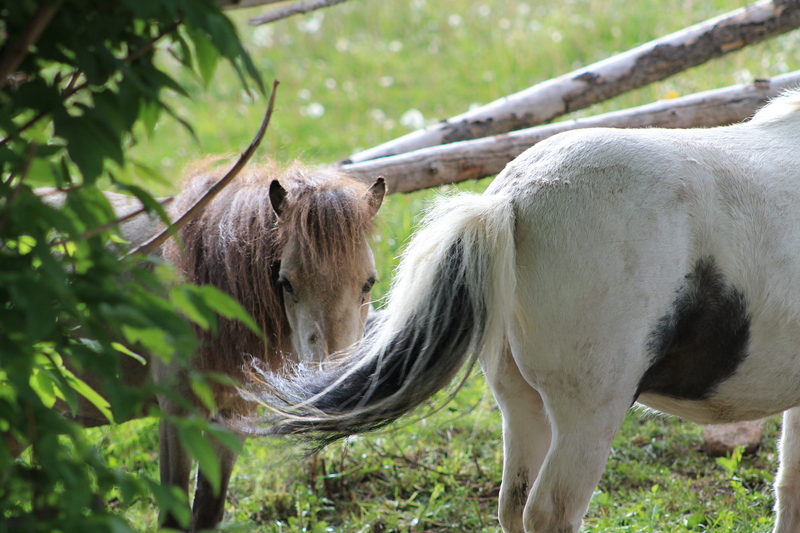 Adorable miniature horses that my horse Banjo was terrified of. Actually the only two things that scared Banjo wasapples and miniature horses. 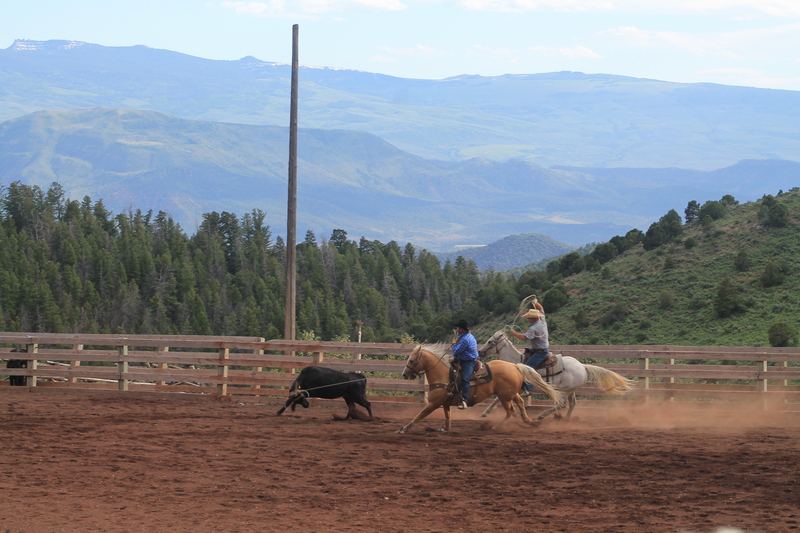 When we were lucky we got to watch actual cattle ropers practicing in the arena. This is an equestrian sport I have no experience what-so-ever with so it was really interesting to me. Oh, and the footing in the arena is made from volcanic rock. How cool is that??! I was really nice too. Don’t worry. They use little helmet type things to prevent the cattle from getting sore from the ropes. Now for the backend…This seemed to be the hardest part. Just love those mountains in the background. 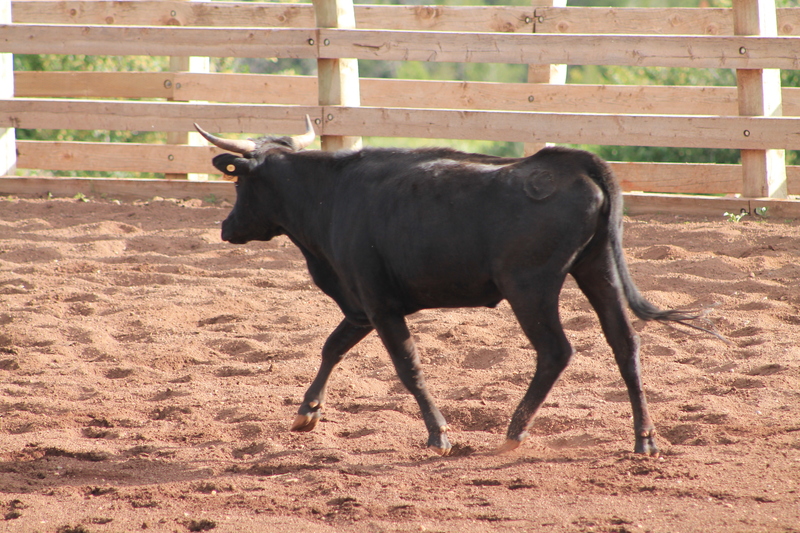 The cattle had surprisingly cute little trots. 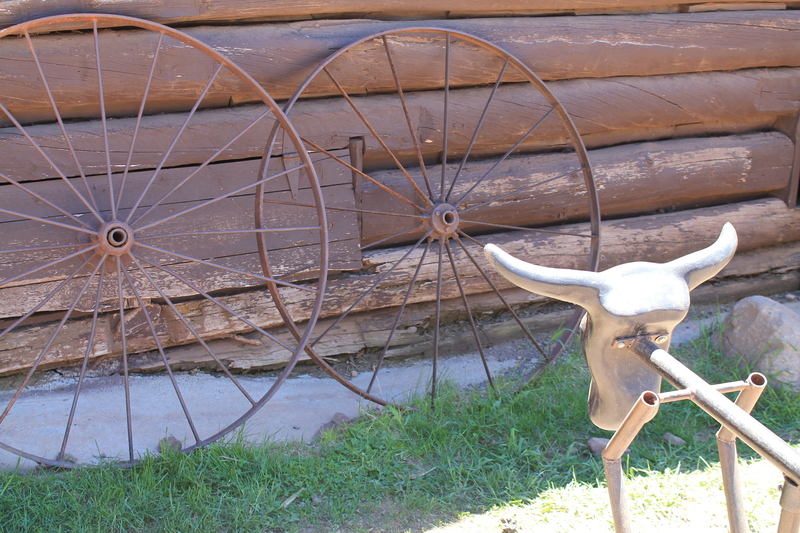 Cattle dressage anyone…? 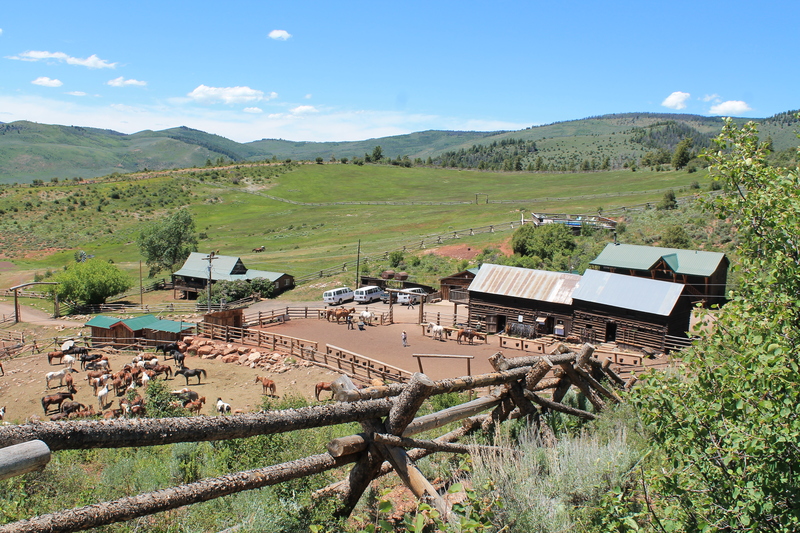 This entry was posted in Black Mountain Dude Ranch and tagged Awesome honeymoons, Black Mountain Ranch, Calf ropping, Donkey, Dude Ranch, Moutain views, Rocky Mountains, the real Colorado. Bookmark the permalink.